I’m so excited. I’ve just made a proof of concept of the article-syndication idea I previous wrote about. The proof of concept is entirely demonstrated on GitHub. Files in submodules cannot diverge from the original. 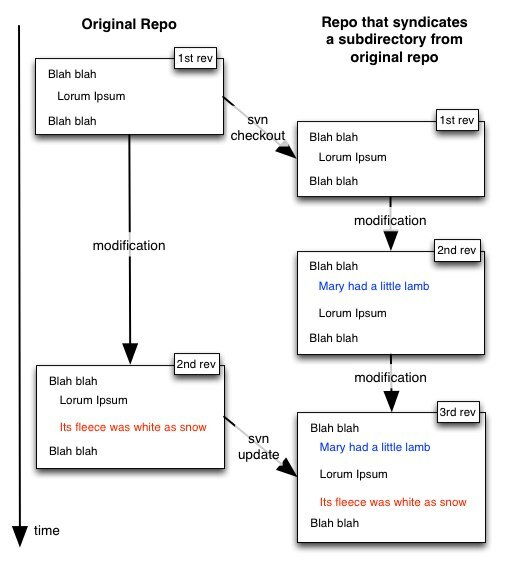 So Submodules were out, until the Git team upgrade them to a) allow maintained divergence, and b) sub-directories to be tracked rather than the whole repo. We going to syndicate a single file from one repo to another. Actually that’ll be a single directory because of a subversion limitation. We’re not going to track anything else from the original repo, and for fun, we’re going to map it into another directory. We’re going to have a modification to the original, and a separate modification to the syndicated one. Both repos exist on GitHub, as this isn’t just a hypothetical case. The third commit was where, on the command line, I did ..
git commit -m "upstream publications changes pulled into syndicated version (that had maintained divergence)"
It merged the upstream text change without complaint. Of course given I checked in the .svn folder, it’s changed a bunch of stuff in there too. I’m not particularly worried about that, as it is a small cost for the ‘maintained divergence’ that I’m wishing for. Ordinarily you would never use Git and Subversion like this together, but I am very deliberately ignoring the Git-Svn best practice and toolchain. See the “Previous Blockers” above. We should also consider a ‘tooling cost’ to this design. Specifically ‘git pull’ is not going to do ‘svn up’ for you. You’re going to need a new mechanism to check for (or consume) upstream changes. Similarly, the upstream repository is not going to find it easy to take back cherry-picked changes which is desirable for spelling and other corrections. The directory ‘subdir’ has to be syndicated because of a limitation of subversion’s checkout. All we really wanted was ‘test’, but we have to have the director too. That said, it can easily be renamed under Git, and still be connected to the correct directory upstream. Yeah, and I kinda wish I’d done some examples using Jekyll and markdown articles to simulate how newspapers or content publishers would do this.